So you’re wondering who has the best IPA in your metropolis. But how in the world can you figure this out? You can’t drink all of them at once. You’ll pass out before you finish and never know who won. You can’t drink one a day until you’ve gone through them all. That would take too much time. And over time, people change. Hair styles change. Interest rates fluctuate. There is an answer: The Annual (insert name of your town here) IPA Challenge. The expert panel of judges prepares to sample the IPA at Bunkhouse Brewery. It’s simple as 1, 2 3 … 4. OK, 5. Maybe 6. Assemble a group of friends, family, distant relatives, dentists, co-workers, sanitation engineers, Methodists, or just people you’ve passed once or twice on the street. The one thing they must have in common? They’re love of India Pale Ales. Find someone who doesn’t like that hoppy swill guaranteed to make you pucker more than a teenage girl taking a selfie. This individual will be in charge of procuring the samples, keeping things on time, knowing the order of the tasting, and generally chauffeuring everyone else around. The bossier the better. Pick an afternoon when almost everyone can attend. A Saturday not during the college football season is usually a safe bet. Make a list of all the breweries in an area of your choosing. If you live in a big city, maybe there are enough breweries in the chosen area that you can walk to and/or take public transportation. If you live in a smaller area, maybe it’s all breweries within a certain distance from the city center. Your choice. Then pick a route (clockwise and counter-clockwise work just fine) that lets you hit all the breweries in your chosen area. Visit each brewery, procuring samples of all of their IPAs for everyone (except the boss) and let the judges rate them from 1-5. Try to keep the identity of each IPA secret, if you can. NOTE: It’s OK if judges know the names of their fellow judges. 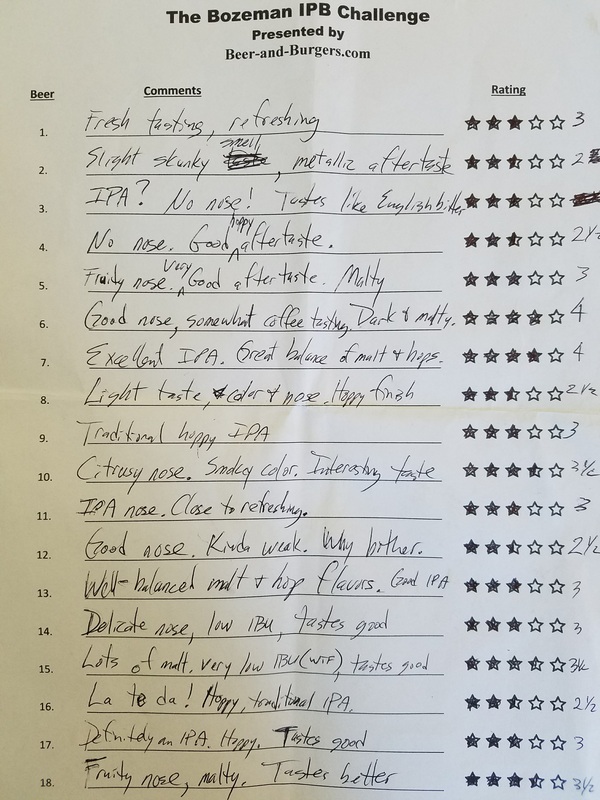 When you’ve hit every brewery, tally the points awarded for each different IPA, divide by the number of judges, and voila, the best IPAs will be the ones with the highest score. Sample scorecard #1 — the evidence indicates this judge clearly is in control. Well, not yet. First the details. 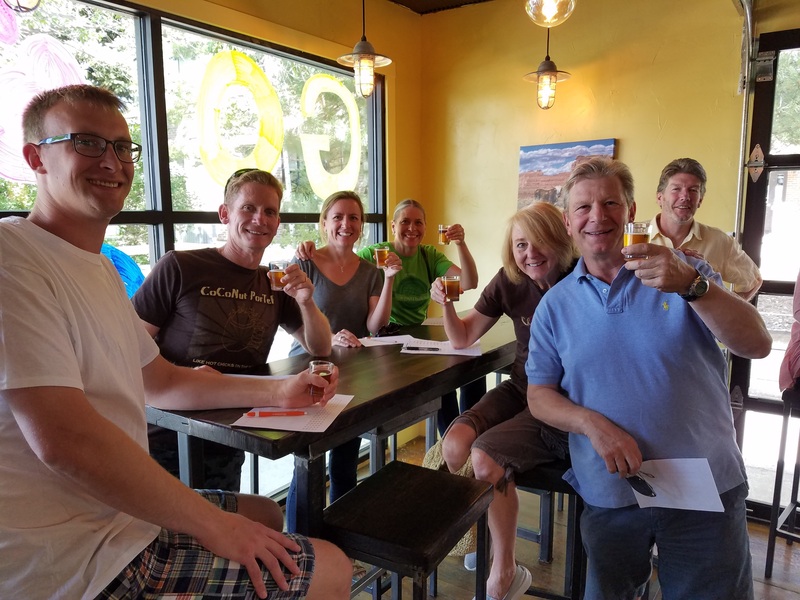 A distinguished group of IPA judges was assembled a few Saturdays ago to hit all the breweries in a 10-mile radius of downtown Bozeman. The breweries in the challenge, in order of visitation, included Bridger Brewing, Bunkhouse Brewery, White Dog Brewing Co., Bozeman Brewing Co., 406 Brewing, Map Brewing Co., Madison River Brewing, Bar 3 Bar-B-Q & Brewing, and Outlaw Brewing. The hope was to taste two IPAs at each brewery. But not every brewery had two IPAs. Two had three. And two had one. So the total number of IPAs tasted per person still ended up being 18. Madison River’s double IPA hits you with 9% ABV and an IBU rating of 101, while the Outlaw’s IPA is a more standard offering at 5.6% ABV and 63 IBUs. Sample scorecard #2 — the evidence indicates this judge clearly had issues. And finally, the winner … for the second year in row. There were a number of other IPAs that fared well during the challenge. And to those, we give an Honorable Mention nod. Checking in with a 3.1 average score were the Vigilante IPA from Bridger Brewing, the Double IPA from White Dog, and the Hop Punch IPA by 406 Brewing. So there you have it. Another successful Annual Bozeman IPA Challenge. Now I challenge you to create your own IPA challenge in your town. 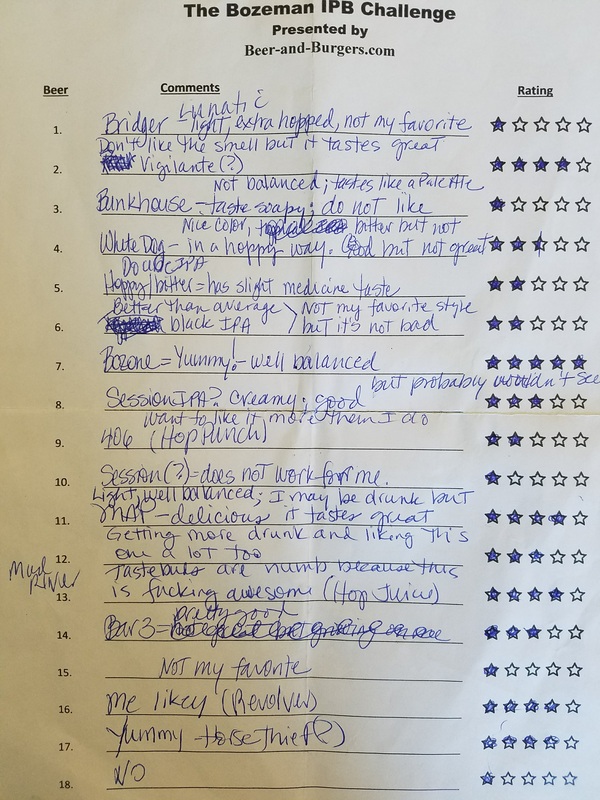 This entry was posted in Beer related and tagged beer, craft beer, craft breweries, hop, hoppy, hops, IPA, Montana craft breweries. So is this event now the JW-RVS Annual IPA Challenge? It should be! Enter your email address to follow Beer-and-Burgers.com and receive instant notifications of all new posts via email. 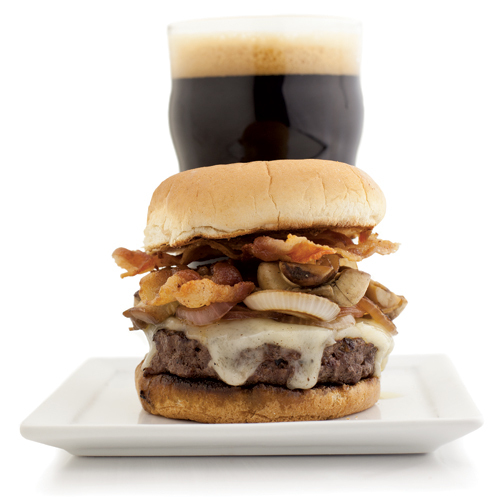 You choose: Beer, or Burgers?